As we drove around the northern edge of Lake Ohrid from the border crossing we felt less than inspired. It was overcast, threatening to rain, and any campsites we could see not only looked closed but terminally so. As we reached the sprawl of the town of Ohrid itself, supposedly the gem of Macedonia, we weren’t further invigorated. A quick stop at the friendly tourist office, started to put matters right. We bought a map of the country, and a walking tour map of Ohrid itself. They thought there was a campsite open on the edge of town and welcomed us to the country. Having got the basic polite everyday phrases off pat in Albanian, we now had to work hard to do the same in Macedonian, and to navigate the local version of the Cyrillic alphabet. We headed in search of the campsite and found it was in the process of being built on. Lovely wooden houses by the lake, but no more camping, just the last few dying caravans gathered together in a corner, as if in mourning. We decided to see if any of the dead looking sites we’d passed earlier could be revived, and followed signs for what we thought could possibly be one down a narrow lane towards the lake. The gate was closed, but we could see a couple washing up at some sinks just inside and they pointed us in the right direction for Lubko, evidently the man who ran the site. He ushered us in and brought us on a circuitous route round all the fading huts and caravans, and across the beach, to a newly mown grassy patch by the lake. It would do as a one-nighter anyway, and with that it started to rain. Next morning the sky was magnificently clear and the lake sparkling. We’d got through a wet night, and I’d spied a washing machine in the utility room beside Lubko and Mrs Lubko’s shower which we were using. Although we had been eager to press on to see the town and drive further into the country, the lure of a clear sky, a huge washing machine and handy trees for a washing line was too much. Especially with Adrian a day or so away from crisis point on the boxers and t-shirt front. So Mrs Lubko supervised the putting in of clothes into the machine, with its detailed instructions in Swedish on the front, ensuring I was keeping coloureds and whites separate. While it churned away, Lubko asked us to join him, Mrs and one of their pals in their messy front garden for coffee. 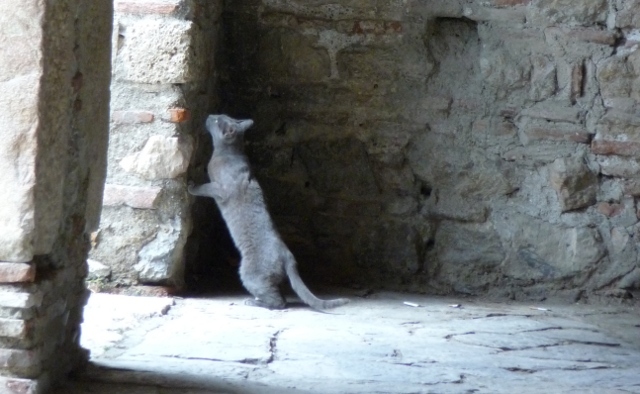 He gestured towards the large plastic water bottle on the table. No we were ok for water. Ah, not water at all, but rakia. Just after breakfast, but it would have been rude to refuse. Suddenly it all felt very Eastern European. Bar a few words there was no common language, but England seems to be synonomous with football here, and Lubko fetched out his Man U shirt with Rooney on its back to show us. 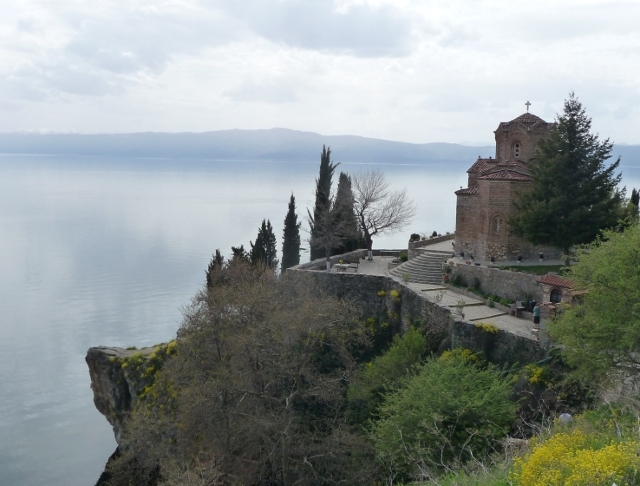 After two enormous loads of washing were out on the line, and a quick picnic lunch consumed, we got on our bikes and cycled into Ohrid, through the pedestrianised shopping streets and on down to the lake front – locking the bikes up in the square. Our walking tour map in hand we followed the route into the older part of town, and discovered why Ohrid is so highly thought of by Macedonians. 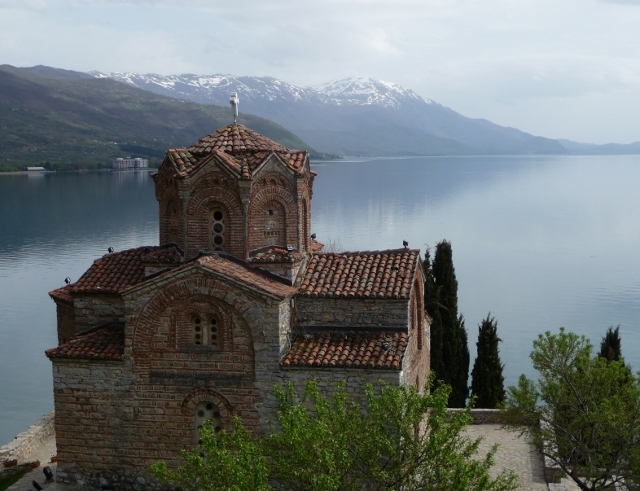 For one, Lake Ohrid is their seaside, secondly it has some pretty, if very done up, buildings, and it has some amazing old churches. Being a popular town, the churches charged entrance fees, but this was fine because it did mean they were open and we didn’t have to play hunt the key. After paying a quick visit to a handmade paper workshop and gallery, we entered the large Sveti (Saint) Sofia church with incredible frescoes and icons and more brightly lit than some we’ve been to so you could see clearly the golden magnificence. Unfortunately few of these churches allow photography inside. We then followed paths upwards and around the headland to Kaneo. A small outlying fishing community tucked into a cove – only reachable by boat or foot. Above this on its own point, is the delectable tiny but beautifully formed Sveti Jovan (St John the Theologian). We had a tour of the wonderful frescoes in French from the custodian, and strolled around looking at the magnificent views across the lake. From here it was a climb up the hill, towards the castle. Unfortunately, the Sveti(s) Kliment and Pantelejmon at Plaosnik were closed for a major overall of the church itself as well as obvious archaeological work on the remains of the early basilica beside it. All we could do was gaze longingly through the fence and continue upwards. The castle sits magnificently above the town – the walls all still remaining and open for walking on. 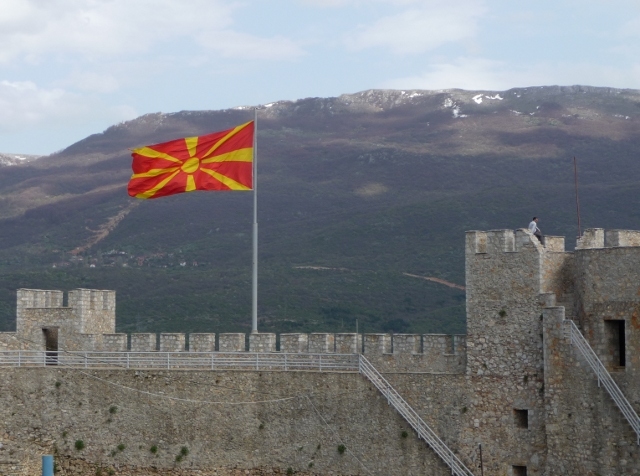 Topped by the brightly coloured sunburst of the Macedonian flag, it’s an impressive sight. From there we walked back down towards the town, stopping at another gem of a church also undergoing some restoration to its exterior, but thankfully its interior was open for visits. Another beautiful spiritual space with the wonderful carved iconostasis gateway to the altar area, with the icons themselves, and more stunning frescoes. 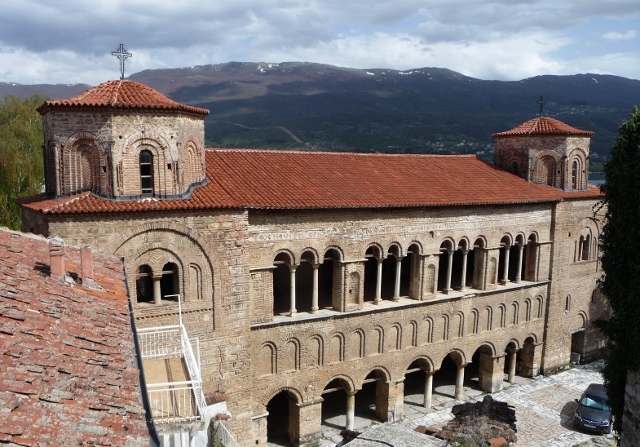 We really love the style and the spirituality of the Balkan churches, deceptively simple and intimate in feel. It is a refreshing change from the imagery and decoration of the Western European Catholic churches. A few more alleys of meandering lead us back to the square and our bikes, and we cycled back to the campsite via the vegetable market which was still going on in the late afternoon. We were in time for a leisurely sundowner by the lake before preparing dinner – our impressions of the country had improved greatly over the course of the day. This entry was posted in Art & Culture stuff, By Country - Macedonia, Travel stuff. Bookmark the permalink. Helpful thanks, we are planning to caravan to Ochrid next year. Anymore directions to the site would be welcomed. If you have a look on Google Maps or whatever just North-West of the edge of town, you’ll see the coast road. Follow that away from town, from the fork where it meets “Goce Delchev”, and you’ll see a small road peeling off the apex of a bend towards the coast. It’s labelled on Google Maps as “Hotel Daljan”. The campsite’s right next to the hotel. We make no promises of it being the best of the town’s campsites if the others are open. But, for us, it was the only one that was open. That’s great! Many thanks Adrian and Elly, if we make it there, we’ll say Zdravo from you.